As I have been a believer in God for as long as I can remember, I often have read passages like Luke 15:3-6 with the perspective of the 99 sheep who seemed relatively safe–even left alone “in the open country.” As a long-time believer and as a pastor, I have even moved toward the perspective of the shepherd who goes out and finds the lost sheep. I don’t think that having either of those perspectives has been wrong, but only having those perspectives leaves me spiritually dry, where I know in my head that God’s grace is amazing, but in my spirit it can be a bit stale. Lately I read passages like Luke 15 also from the perspective of the one lost lamb whom the shepherd specially goes out to find, and when he finds me, he rejoices, even calling his neighbors to celebrate with him. 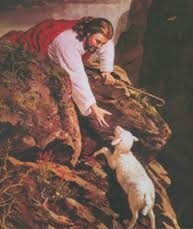 Indeed, I not only was a lost lamb a long time ago–before I can remember, but I still am that vulnerable lamb today, a completely broken and lost lamb but by the grace and love of God. Yes, I’m of the 99 too, and thankful for the life-long process of transformation/sanctification that has come with it, though frustrating often enough because my human-ness that will always be there until I finally enter heaven. But, I am also that lamb who is found, who is forgiven, who is saved, who is rejoiced over, and well, who gets the heavenly-attention in the parable. Then, wow, is God’s grace ever fresh again! May that freshness of God’s salvation and grace motivate you, if you also are one of the 99, to join him in his work in the harvest fields (Matthew 9:36-38). I personally find that much more motivating than the often-heard rallying cry to the 99 to “Come on! Get going!” That kind of motivation, which I have unfortunately preached at times, might make us like the older brother toward the end of Luke 15 who felt out of the party, beyond being a lamb worth rejoicing over. ← Faith that brings Peace, and is Relevant.